A recent article from WBEZ stated that a record-breaking number of Chicago students met state standards for standardized tests. The Illinois Standards Achievement Test [ISAT] showed that 74.2 percent of Chicago Public Schools students in third through eighth grade met state standards, which is the highest percent to date. This is especially important for those middle school students who are seeking entrance into selective enrollment high schools. The majority of the CPS admission process focuses on seventh grade performance. 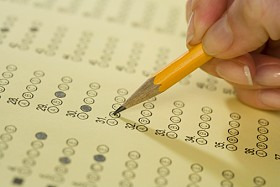 In addition to grades from this year, the standardized tests (ISAT, TerraNova, Stanford10, IOWA, CAT, KTEA II, Woodcock Johnson III or WIAT III) are a critical factor in determining admissions, with each test being worth 300 points. The seventh grade is essential for successfully completing the first two parts of this selective admission process. There are several resources available to achieve the 600 points possible in these two areas. Make sure your child is completing their homework and help them with any problems they may have. Monitor the grades on their tests, projects and homework so you know if they are getting the grades necessary for admittance to one of these schools. Establish a relationship with your child’s teachers to help assure that you are aware of what is being taught, what assignments or projects are coming up and be aware of your child’s successes. Most importantly, if a child is struggling in certain academic areas, there are tutoring options available that can create a specific program specific to your child’s needs and goals. Preparing for the 7th grade standardized test is best done with proper tutoring. ISAT test prep tutors are trained and qualified to teach test prep classes. However, it is still important to monitor your child’s test taking abilities and test scores throughout the beginning of the 7th grade academic year. Chicago Academic offers both academic tutoring and 7th grade standardized ISAT test prep to help students successfully achieve admission to their school of choice. To learn more about the services we provide please contact us today!